Lesjöfors Sports Lowering Spring kits are designed to lower a car by as much as 50mm, to provide a sportier driving experience. By lowering the car's centre of gravity and increasing the stiffness of the spring, road handling is substantially improved. Lesjöfors Sports Springs are designed with a high degree of accuracy using specialist design software developed in-house. Lesjöfors Sports Springs lower the vehicle by between 20 - 50mm, which is considered moderate by some. However, Lesjöfors Sports Springs are designed for a sportier driving experience rather than purely for aesthetic purposes. 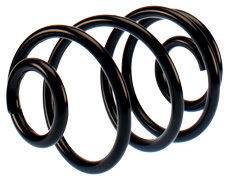 Springs which lower by more than 50mm often reduce or eliminate the spring travel distance, negatively affecting spring performance and creating problems coordinating with standard or gas shock absorbers. Lowering a car's centre of gravity and increasing the stiffness of the springs reduces body roll, making the car stick to the road while cornering. ‘Nose dive' caused by braking and ‘squat' during acceleration are also reduced.